Self-driving cars could account for 21 million new vehicles sold every year by 2035. Over the next decade alone such vehicles—and vehicles with assisted-driving technology —could deliver $1 trillion in societal and consumer benefits due to their improved safety. For autonomous vehicles to make good on that promise they will need onboard artificial intelligence (AI) technology able to link them to highly detailed maps that reflect every change in the status of lanes, hazards, obstacles, and speed-limits in real time. Researchers at the NYU Tandon School of Engineering are making this critical machine-to-machine handshake possible. 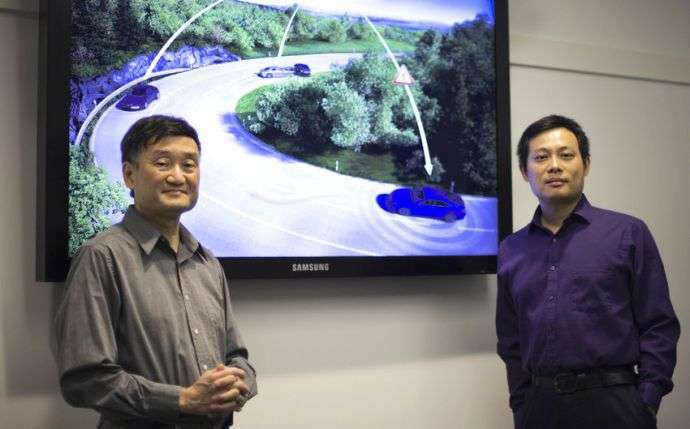 Yi Fang, a research assistant professor in the Department of Electrical and Computer Engineering and a faculty member at NYU Abu Dhabi, and Edward K. Wong, an associate professor in the NYU Tandon Department of Computer Science and Engineering, are developing a deep learning system that will allow self-driving cars to navigate, maneuver, and respond to changing road conditions by mating data from onboard sensors to information on HERE HD Live Map, a cloud-based service for automated driving. The NYU Multimedia and Visual Computing Lab directed by Professor Fang will house the collaborative project. Fang and Wong recently received a gift fund from HERE, a global leader in mapping and location-based services owned by Audi, BMW, Daimler and Intel, with Tencent and NavInfo of China and GIC of Singapore also poised to become investors during 2017. NYU Tandon is one of HERE's first university research and development partners in HERE HD Live Map. High-definition (HD) maps meant for machine-to-machine communication must be accurate to within 10 to 20 centimeters. Self-driving vehicles need to continuously update, or register, their location on these maps with an equally high degree of accuracy, according to Fang, who said that the goal of the collaborative research is to enhance car-to-map precision to within 10 centimeters. "Essentially, we want to be able to precisely match what the car sees with what's in the cloud database. An incredibly precise ruler isn't of much use if your vision is blurry," he explained. "Our work involves employing computer vision techniques to refine the vehicle's ability to continually locate itself with respect to HERE's cloud-based service," said Wong. "That requires real-time images of the street and surrounding objects derived from cameras, LiDAR [a laser-based range-finding technology], and other on-board sensors." 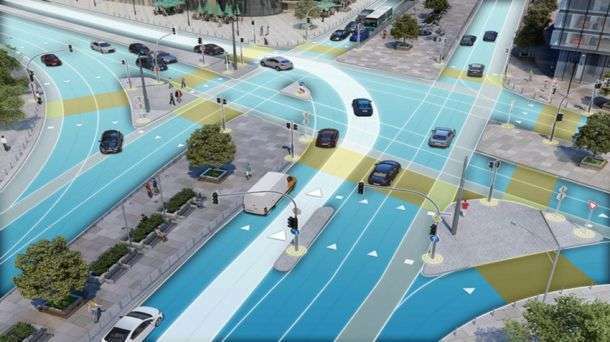 The researchers added that this precision is also important because automobiles connected to HERE's HD Live Map service will deliver data to the cloud on road conditions, traffic, weather, obstacles, speed limits, and other variables, allowing the service to upgrade nearly in real-time to reflect changing conditions. "3D computer vision and Deep Neural Network are the technologies driving the development of high- definition live maps for self-driving cars," said Xin Chen, HERE senior engineering manager and research scientist. "We're excited to kick off a long-term research collaboration with Professors Wong and Fang individually based upon their expertise in this domain as well as with NYU as a top institution for research and learning in the field." "The convergence of cybersecurity, big data, wireless technology, and artificial intelligence is already revolutionizing how people live and travel, and it holds the promise of safer transportation for billions across the globe," said NYU Dean of Engineering Katepalli R. Sreenivasan. "We gratefully acknowledge this research gift funding from HERE, which will advance the important work of Professors Wong and Fang and the students assisting them in this new frontier." The HERE mapping project joins a number of recent initiatives at NYU Tandon addressing safer and smarter transportation. The U.S. Department of Transportation selected a research consortium led by NYU Tandon Department of Civil and Urban Engineering researchers to become the first Tier 1 University Transportation Center (UTC) in New York City, dedicated to using data to make every mode of surface transportation - from walking through mass transit - more efficient and safe. Another venture - headed by a cybersecurity research team in the Department of Computer Science and Engineering - is developing the first free, open-source method for automakers to secure software updates. Uptane will protect vehicles from cyber criminals and cyber war while providing the auto industry with an inexpensive and quick way to install safety fixes. Will this be complementary to the localisation layer that Mobileye is building with it's REM technology? Or will this be used as a fine-tuning technique for REM?